Want to earn money for you school, organization or charity quickly and easily? Our popcorn fundraiser will be perfect for you! You get 50% PROFIT on every single item sold! 1. Determine when you want to begin and end your popcorn fundraiser. We suggest running your popcorn fundraising program for 2-3 weeks for maximum selling potential. 2. 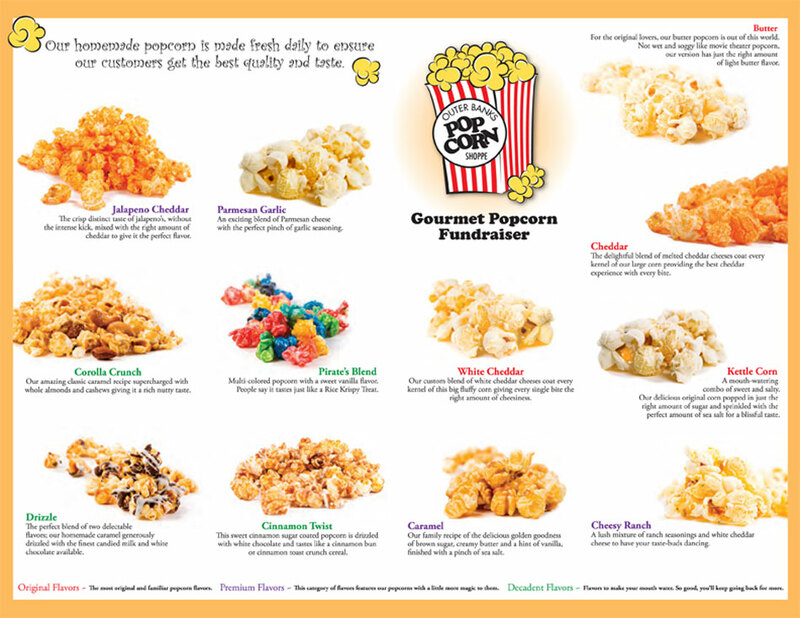 Email us at obxpopcornshoppe@gmail.com to request your popcorn fundraising forms. We will email you a digital file so you can print the fundraiser forms out. We highly suggest printing them on a cardstock. This email will also explain shipping rates and initial deposits before production of your order begins. Please include the ship to address, organizations names, phone number, and your start date. 1. Collect all order forms and payments. 2. Create a master list and tally all items together for a grand total of each individual item. 1. Your organization can pay via cashier check, money order, organization check, or any major credit card. 1. Orders will ship within 14 days of receiving your final fundraising totals. We will send an email confirming we received your totals and required half down deposit. 2. Orders will be shipped via UPS Ground. View our easy to use popcorn fundraiser form below and remember you get 50% PROFIT! Email us at obxpopcornshoppe@gmail.com to get started today!